CHICAGO, March 18, 2008 — The Association for Corporate Growth (ACG), the premier professional organization focused on corporate growth, corporate development, and mergers and acquisitions, has named Alan Gelband, founder of Gelband & Company, with the ACG Lifetime Achievement Award for his longstanding dedication and service to ACG. Lifetime Achievement Award recipient Mr. Gelband, who founded Gelband & Company in 1975, has been an investor, analyst and investment banker since 1969. 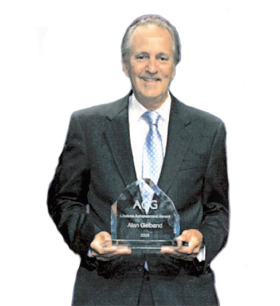 Mr. Gelband is a past president of the ACG New York chapter and also served as president of ACG globally from 1992–1993 and served as a Director of ACG for the past 19 years. His passion and unwavering focus for delivering high-quality programs has contributed to both the success of the New York chapter, as well as the entire ACG organization. Now an Honorary Lifetime Director, Mr. Gelband’s legacy lies in the immense growth and great value provided to ACG New York and ACG members during his tenure and beyond.